The final Moto2 preseason test wrapped up Thursday at Jerez, and one rider dominated all three days – Takaaki Nakagami. 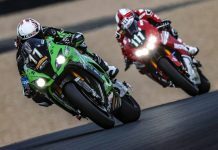 The Japanese rider was quick Tuesday and Wednesday, but reduced his best lap time even further Thursday for a 1:42.206 around the Spanish circuit. The Idemitsu Honda Team Asia rider finished just under two-tenths of a second ahead of Kalex of Dynavolt Intact GP’s Sandro Cortese. Though he was quickest, Nakagami was unable to complete extended race-simulation runs due to experiencing problems under braking and having “strange” feelings with the design of a new fuel tank. Taking the third- and fourth-quickest times were both Suter machines with pilots Tom Luthi (Interwetten Paddock Moto2) and Xavier Simeon (Federal Oil Gresini Moto2), respectively. Luthi was also unable to perform any race-simulation runs due to feeling the effects from a crash that occurred on Wednesday, his team reports. Fifth went to AirAsia Caterham Moto Racing’s Johann Zarco, who trailed Nakagami by four-tenths of a second. Zarco’s teammate, the American Josh Herrin finished 21st, 1.416 off the top time. Rounding out the top 10 were Luis Salom (Pons HP 40), Lorenzo Baldassarri (Gresini Moto2), Alex de Angelis (Tasca Racing Moto2), Dominique Aegerter (Technomag CarXpert) and Simone Corsi (NGM Forward Racing). This year’s possible Moto2 title contenders Maverick Viñales and Jones Folger missed the top 10 aboard their respective Pons HP 40 and Argiñano & Gines Racing teams. As for the Englishman Sam Lowes, the Speed Up pilot ended his impressive week 14th quickest. Lowes is battling through the pain of a swollen tendon. With reigning champion Pol Espargaro having stepped up to MotoGP, the battle for the vacant Moto2 crown will commence as the teams and riders head to Doha ahead of next weekend’s season-opening Commercial Bank Grand Prix of Qatar.